The school Easter Holidays are upon us and it is very nearly time for the biggest transport event of the year at Beamish – the Great North Steam Fair. 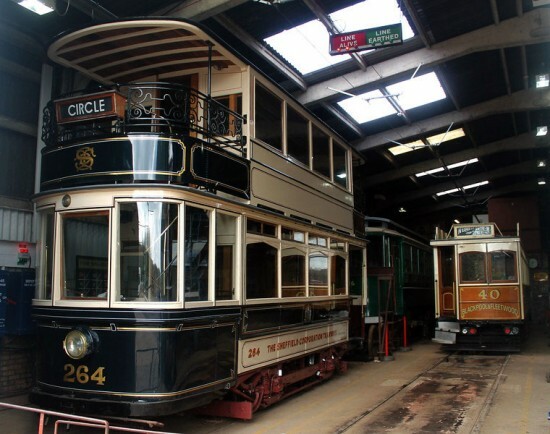 With the museum busier than recently on a weekday, Tuesday 9th April 2019 saw a four tram service in operation; Sunderland 16 and Blackpool 31 were running on the clockwise circuit with Newcastle 114 and Oporto 196 operating anti-clockwise. The two visiting trams – Blackpool & Fleetwood 40 and Manchester 765 in case you’ve forgotten! – remained in the depot with 765 now on Road 1 and 40 on Road 3. There has been further movement around the depot with Oporto C65 now back in its former space on road 4 with its place at the head of road 2 now taken by Sheffield 264.